The proposed design for the new "City of Champions Revitalization Project" in Inglewood, CA. HKS Inc.
Los Angeles just got one step closer to securing their first NFL franchise since 1994. 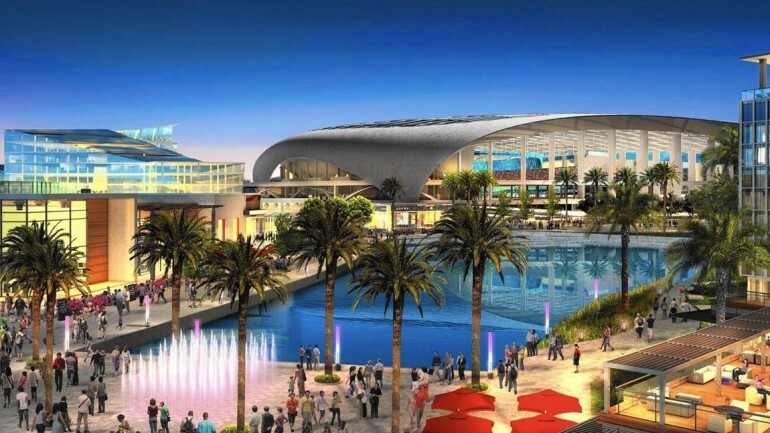 Stan Kroenke, the owner of the St. Louis Rams announced on Monday plans to build a new NFL stadium in Inglewood, the former site of Hollywood Park racetrack and casino. Kroenke purchased over 60 acres of land a year ago and has now joined forces with the owners of the Hollywood Park Site and hedge fund, Stockbridge Capital Group. The current plan is to develop the nearly 300 acres into a shopping mall, office, hotel, residential, entertainment/performance venue and an 80,000-seat NFL stadium. Kroenke’s stadium is the 12th proposed stadium in nearly twenty years as Los Angeles has tried and failed multiple times to bring an NFL team back to the second–largest media market in the world. However, this current proposal is the most concrete to date considering Kroenke himself owns the land, and a current NFL team that is poised to make the move. In addition, the Inglewood stadium project currently being called the “City of Champions Revitalization Project,” is expected to not cost a single dime to Los Angeles taxpayers. Later this month, the St. Louis Rams will be able to convert their current lease at the Edward Jones Dome into a month-to-month. It’s been no secret that Kroenke and the Rams are unhappy with their current stadium situation and that massive upgrades are necessary. With today’s announcement, it will put tremendous pressure on the Mayor and city of St. Louis to either pony up the $575 million necessary to make the stadium improvements, or allow the team to return to Los Angeles. The mayor of Inglewood, James T. Butts Jr. told the media he was extremely supportive of the project and that he would try and add the new sports and entertainment complex to the previously approved Hollywood Park development project. Butts told the media that with “speed construction,” the stadium could be completed by 2018. Kroenke is also the owner of the Denver Nuggets (NBA), the Colorado Rapids (MLS), the Colorado Avalanche (NHL) and English soccer club Arsenal.